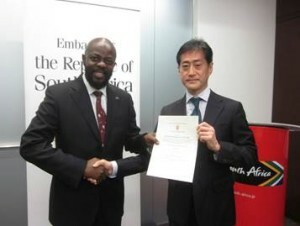 Kawasaki Kisen Kaisha, Ltd. (“K” Line) is proud to announce that we were awarded a certificate of appreciation by Embassy of the Republic of South Africa in Japan. “K” Line Group has been supporting the Mobile Library Project of SAPESI (South African Primary Education Support Initiative) to improve quality of primary education in the Republic of South Africa since 2011. We have provided free ocean transportation of books donated all over the world for children in that country with the total books transported to South Africa through our global network having now reached as many as 164,000. “K” Line hopes that these books are proving to be helpful for children to continually expand their learning and lead to the realization of their dreams in the future.